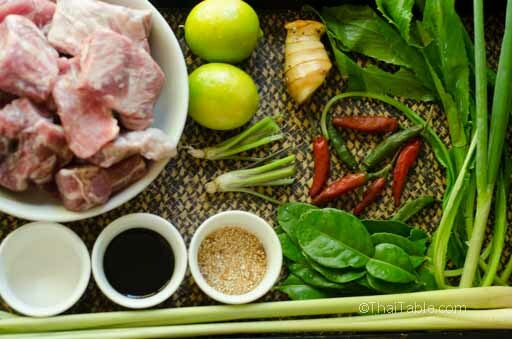 Another thing that’s great about Thai food that it’s alive and ever-changing, with a complex meandering journey. The Tom Sab I had known as a kid has transformed and now branched out into new directions. ‘Tom Sab’ originates from Isan or northeast of Thailand. Over 20 years ago, when you referred to ‘Tom Sab’, it meant a spicy dish with a clear soup, full of chewy tripe and inner beef organs. Now, Tom Sab is an entire category of dishes. With the rise in popularity of Goddess Guan Yin, many followers stopped eating beef and turned to pork instead. 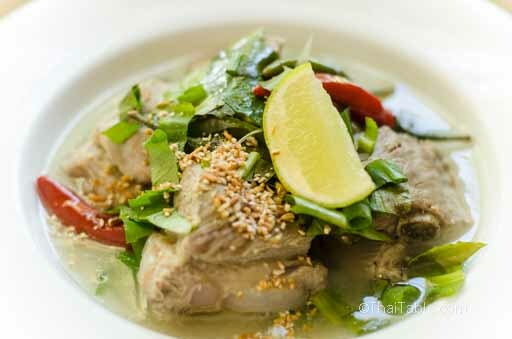 Combining the spicy soup from the northeast and a Chinese cut of pork, Tom Sab Leng was born. Leng is a Chinese name for pork backbones. Some restaurants took Tom Sab Leng even further into the Chinese style by adding daikon. Others, added carrots reflecting the new foreign root vegetable. 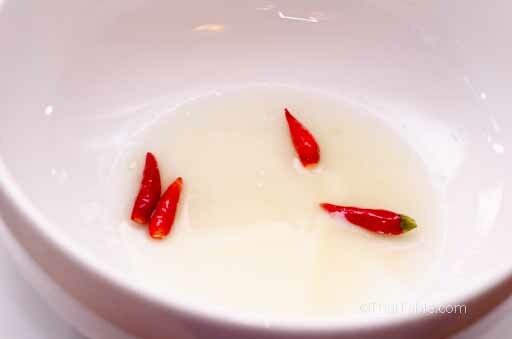 Now it seems every restaurant in Bangkok has rushed to put this part Chinese, part northeast soup on the menu. Let’s find out why the soup is so good that everybody wants to claim a style to it. You can also break up the process into 2 steps: slow cook the pork backbones and season the soup. You can let it cook during the day and come home to have the soup at night. Or you can cook it the day before and let it sit overnight. Heat up the soup the next day and have it for dinner. 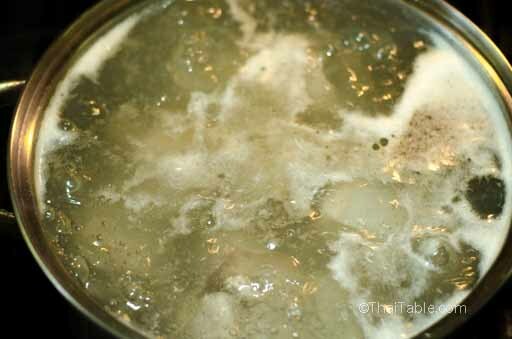 If you let the soup sit overnight and your kitchen is cold, you can easily remove the solid fat floating above the broth in the morning. You may need about 2 limes or more. A lime can give as many as 4 tablespoons of juice. You can substitute pork ribs for pork backbones. Culantro (not a "cilantro" misspelling), aka sawtooth coriander, is available at some Asian markets, usually Chinese, Vietnamese, Cambodian, Laotian and Thai markets. Cilantro will be the closest substitution. Rinse the pork backbones in cold water to remove tiny bone fragments. In a pot, add the pork backbones and 10 cups of water or more, enough to cover the pork. Bring the water and pork to a boil and reduce it to simmer. Cut the galangal into thick slices, about ¼ of an inch. Cut the lemongrass into 3-inch pieces. 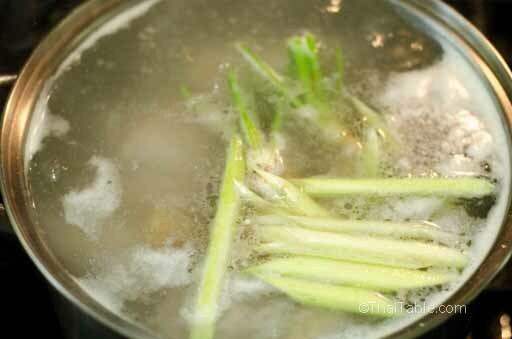 Add the sliced galangal, lemongrass and cilantro roots into the pot. Let the soup simmer until the meat is tender, about 1-2 hours depending on your stove. 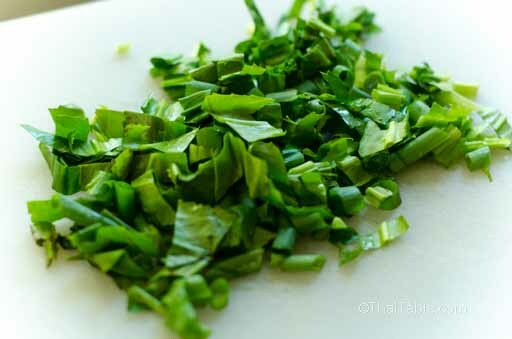 In the meantime, slice the green onion and the culantro about ½ an inch. Tear the center stems off from kaffir lime leaves. When the soup is ready, add salt to the pot. Taste the broth to see if it needs fish sauce. You may or may not need fish sauce. 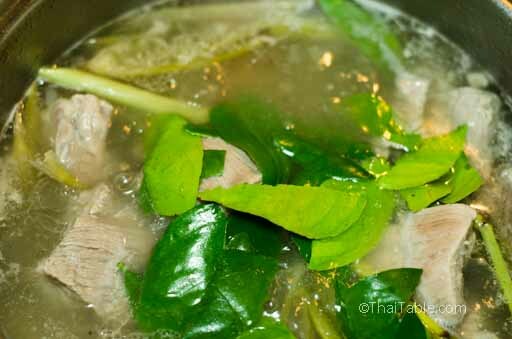 Add the kaffir lime leaves and let it boil before turning off the heat. When you’re ready to serve, add 1 tablespoon of lime juice and a few chili peppers to per serving bowl, not in the pot. You might need more lime juice if you like your soup sour. Serve the rest of lime juice or lime wedges at the table. Crush the chilies if you love spicy soups. Ladle the soup into the bowl. The soup will turn milky white from the lime juice. Sprinkle green onion, culantro and toasted rice on top. You can also add the optional ground dried chili pepper for extra zing. Serve the soup hot with jasmine rice. Please do not eat the galangal and lemongrass. They are tough to chew and are for flavoring only. 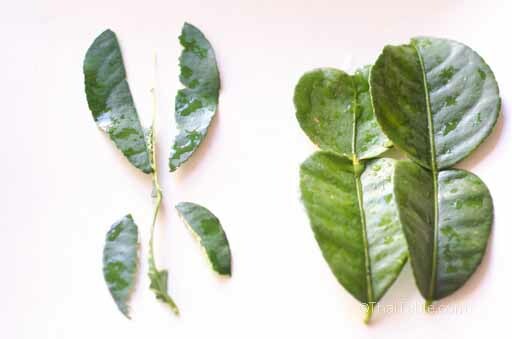 Many people will eat the kaffir lime leaves but some people push them aside on their plates.